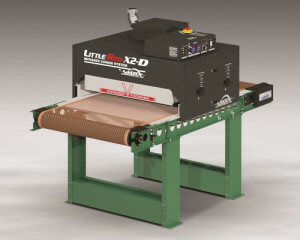 Vastex International has introduced the LittleRed X2D infrared dryer. This dryer cures rapidly direct-to-garment (DTG) printed textiles, as well as plastisol, water-based and discharge-printed garments at high rates. The X2D model features a high powered pre-heating zone that surges ink temperatures to over 149ºC within the first several centimetres of conveyor travel inside the 69 cm heating chamber. Two closely spaced, height adjustable infrared heaters and dual zone heat controls maintain consistent temperatures needed for DTG and all other inks. Rapid preheating maximises the dwell time for each kind of ink, allowing increased conveyor belt speeds and dryer output. Model X2D-30 has a 76 cm wide belt, two 61 cm wide infrared heaters (6300W @ 240V total wattage). 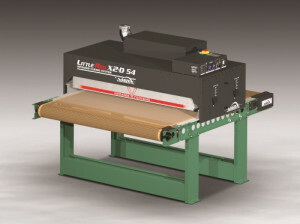 This model cures up to 240 or more garments per hour with plastisol inks, up to 90 or more garments per hour with water-based inks, and up to 26 garments per hour with DTG/digital white ink at 3.5 minutes dwell time. Model X2D-54 has a 137 cm wide belt with two 122 cm wide infrared heaters (12,600 @ 240V total wattage). It can cure 480 or more garments per hour with plastisol ink, 180+ with water-based ink and up to 52 garments per hour with DTG/digital white ink at 3.5 minutes dwell time. Both models come with a powered exhaust system as standard to rapidly remove moisture and air contaminates from the heating chamber, as well as to cool the skin and controls. The 168 cm long conveyor is equipped with a low friction belt aligner and belt speed controls to precisely set dwell times from 35 seconds up to four minutes. Fully expandable, additional heating chambers and conveyor belt lengths allow for future expansion as business needs warrant. The heaters of all Vastex dryers carry an industry-leading 15-year warranty, and feature closely spaced coils to provide high-density, medium-wavelength infrared heat for maximum cure speed without cold spots or under curing associated with conventional units. You can see the latest Vastex machines at FESPA, Stand 4.1-D41.